Two antennas cover the band: a crossed-fed dipole in quadrature for low frequencies, and a four-feed loop antenna for the upper band. The loop radiation pattern has a null at top and bottom, eliminating structure interactions that plague crossed-fed dipoles mounted with other antennas. Generous central cavity space allows several large cables to be passed through the antenna for feeding other bands or DF antennas higher up the stack. The substantial mast and flanges allow heavy antennas to be mounted above the OMNI-A0099. 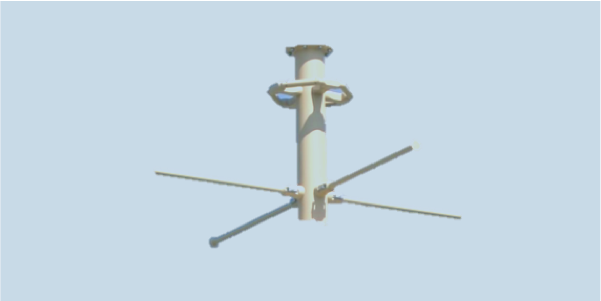 Antenna is part of the SYST-A0004 stack, providing interferometry DF, vertical, and horizontal polarization monitoring in the range 20 to 3000 MHz.